As always, the Tesco Black Friday deals and big discounts on computers/tablets, TV, and much more tops the list each year. While not all areas of the UK will embrace the same, you can count on this page revealing the best deals for Black Friday at Tesco UK. If you have seen some amazing promotions, coupons, or sales ads then feel free to share details below for the Black Friday UK community. Also, share what brands and products you hope to see receive large discounts this year. Our editors along with our readers will detail the latest offering below, but also see official sales pages from Tesco to the right. The Tesco Black Friday deals will be shown right here when live. That is a good point, I see they are adding more and more products online via the Tesco Groceries page so yeah are they going to be doing the BFUK sale this year. Seeing as Tesco Direct online is now no longer, will they still be taking part in the Black Friday Uk sales? When I visit Tesco Direct Black Friday page I keep getting put into a queue, I am guessing the huge flux of people visiting the site is the reason. After like 30 seconds of the countdown clock ticking it opens to show the BF deals. Last year the Tesco BF sale ran for about 11 days, hopefully they do the same this year as that’s many more days of discounts. 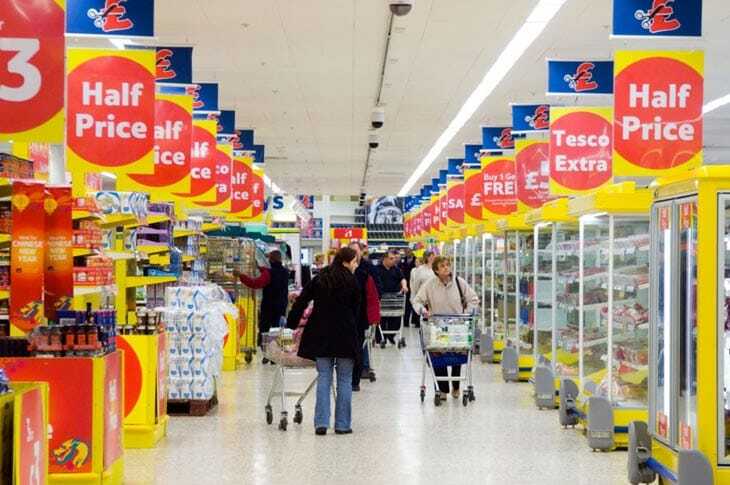 Are the Tesco superstores going to open early again like they did last year at around 5am? Tesco have just confirmed its dates for Black Friday as 20th Nov to 27th Nov online. Not too sure about in store though. The Tesco website says that the Black Friday Event has ended, i am guessing they will do it again this year right? if you visit the Tesco Offers page you will see that they are giving its customers a chance to win a booster seat and a copy of Annabel’s Karmel’s new book. now they are just £9. Tesco online has a F&F clothing sale on right now where you can save up to 50%. On the Tesco Black Friday hub page they show that you can save a tenner if you spend more than £40 when using their money saving coupon. This apparently excludes Tesco partners. Save £10 on Christmas with eCoupon TDX-MXTP when you spend £40 or more. They also have the Acer ES15, 15.6″ Laptop with Intel Pentium, 4GB RAM, 1TB HDD & DVDRW laptop in black for just under £200 thanks to a £80 saving. I just saved a cool £50.00 and only paid £99 for the Acer 11.6″ AO1-132 laptop that comes with 2GB Ram, 32GB storage, 1TB OneDrive cloud storage and more. On the top of their Black Friday page they have 4 tops deals, which include the NOW TV Box with Sky Movies 4 Month Pass reduced from £35 to £19, Tefal Admire 6 Piece Alumiuium Saucepan Set was £150 now £60, then there is the 2 for 1 Spa Day with Four Treatments at a Bannatyne Spa for only £81 and the other is a Tunturi Classic Run 3.0 Treadmill with a £700.99 saving thanksto the Tesco Black Friday sale. The Tesco Black Friday sale is now live and ready for you to save a bargain. y fave deal by far has to be the Call of Duty: Infinite Warfare game which is available for both PS4 and XB1 and only priced at £29 each. This has slightly annoyed me vecause I paid £40 on Saturday. Tesco this year are apparently offering 4 days more to its Black Friday sale, this year they will be offering 11 days of deals. This year’s event will begin at 9am on 21st November Tesco Direct website and at 5am on Friday, 25 November, in the majority of Tesco Extra stores. The 24 hour extra stores will close from midnight Thursday 24th until 5am Friday 25th. Get ready for a big event all. Tesco are holding its 3 for 2 on ALL toys tomorrow November 18th. Thanks for this Jimmy, been waiting on this and very much looking forward to it. Roll on the 21st. At last the Tesco Black Friday countdown page has gone live. It now says Monday 21st November starting at 9am is when the deals go live. The deals are going to run until 1st December 2016. The Tesco Black Friday page still hasn’t gone live, come on hurry up as would love to know what you will be offering. I just saved just under £24 on the Teenage Mutant Ninja Turtles Movie 2 Sewer Lair Playset, loving it. The Tesco 3 for 2 toys sale is still on,this ends today so hurry people. You get the cheapest toy for free. I am looking for Hatchimals and hoping these will be on sale come Black Friday, bet they will not be though as they are too popular. Tesco has not yet updated its Black Friday page, I am guessing they are taking part this year of 2016? Unlike Asda Tesco will give us a good sale I am fairly sure. Yep and the up to half price on selected Toys ends 16/10/16. Best be quick then aint we? This is the final week of the Tesco Half Price Toy Sae, so hurry and shop away. On the Tesco Black Friday / Cyber Monday hub it says the Black Friday countdown to November is on. No leaks of what deals to expect just yet though. Tesco had some great deals last year, but is Tesco holding its Black Friday sale this year of 2016 because they have not confirmed yet? This is pucker, a 6-man tent for just £60 reduced from £120. Search Tesco online with cat number 342-9863. Summer is here and camping is in the wings, so how about shopping at tesco online for its half price camping sale. Summer is coming ladies, so how about the pink medium gloss 4 wheeled Luggage Zone suitcase for just £35 reduced from £80? Save £160.00 on the Vertigo Richmond 700c Road Bike over at Tesco Direct online, just pay £120 now. You can save £250 on the 48-inch Samsung UE48JU6400 Smart WiFi Ultra HD 4k LED TV, which comes with Freeview HD, it was £849.99 but NOW only £599.99 just head on over to the Tesco website and click on the sale section then TVs and away you go or search for the catalogue Number: 245-4992. They have some great deals on Tesco Mobile phones, be good if they could offer other things than just a free selfie stick as i hate them things. Can they offer like a free £10 voucher instead? I just saved a cool £60 on the Samsung Galaxy Tab E tablet, this one has a 9.6-inch display and 8GB, i paid just £99 instead of £159. Wow that is brilliant, I will most definitely be getting the 49-inch Digihome LED TV with Freeview, 49-inches for under £150 that’s amazing. Please tell me that Tesco will be selling iPads, i already have the hudl2 but that’s for my son, I would love a new iPad as a treat to myself. Please keep me posted, thanks guys. I am really watching out for a TV deal, anything over 50 inches would be perfect. It would be good to get a Samsung Smart TV with 4K. Anything under £700 would be nice. Do you have any idea what sort of Black Friday discounts we can expect to see from Tesco? The opening time delay isn’t so bad, only like a few hours and it actually suits be better as i get off work from 4:30am. For £439 you can purchase the Toshiba Satellite Pro R50-B-12U laptop via Tesco and save a cool £50. I just bought the HP Pavilion 15-p264na laptop for only £339.00 , just saved myself £40 and gained 339 Clubcard points. Tesco has recently put up on its website they are having unexpected high demand, so all deliveries will take 5 to 7 days. How will they cope on Black Friday then? The countdown has begun for the Tesco Black Friday event kicking off November 27 – 30. There is only 13 days and 14 hours left the last time i looked. An MP just asked good behavior before the bargain-hunting starts on November 27, I wonder if this will happen with Tesco or if tickets will help on Black Friday. Seems like a good idea. According to a Facebook post an insider of Tesco reveals stores will open up at midnight for Black Friday 2015 with 20 people at a time being able to enter the store. Tesco is introducing again its Boost Tokens where Tesco Clubcard holders will be able to use on Black Friday. This means there will be no price cuts on Black Friday according to sources. This new boost will last from Nov 1 to Dec 27. This means holders will be able to double its vouchers – Example: If holders have a £5 voucher they will be able to swap it for a £10 Boost Token. I have seen over on Tesco Direct online they have the 32-inch LG 32LF580V Full HD 1080p LED Smart TV with Freeview and WiFi for only £269. This is already with a saving of £60, i am so tempted to wait if i can get a better deal TV come Black Friday. Black Friday 2015 is upon us now and I can see special things coming to Tesco. The Tesco Black Friday deals will be fantastic and even better than last year. I want a 4K TV and PS4 package deal during Black Friday 2015. Hoping to get this deal at Tesco, so not buying anything to the big day arrives in a couple of months.